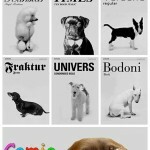 The Comic Sans Project shows us how would the world look like if Comic Sans wasn’t hated into oblivion. See famous brands re-imagined with this non-popular type face. You may also like Cats as Fonts.